Host a Sun Cloud aromatherapy party! Looking for an alternative to a girly day out or evening? Book your place on an aromatherapy workshop or host a Sun Cloud by Kay aromatherapy party! Workshops are held at 3pm on Saturdays by appointment only at our venue in Lincoln. These can be a private booking for you and your friends, or you can come along and meet new people. Everyone will go home with a blend of oils tailored to their own needs. Lots of tips and advice about our products. Workshops last 1-2 hours, depending on number of attendees. Card payments and cash are acceptable. 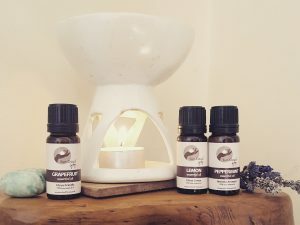 If you prefer to host an evening of Aromatherapy in your own home, these can be booked for Friday or Saturday evenings. Plus, if 2 guests book their own parties, you will receive an aromatherapy air freshener set (once the parties have taken place). £25 deposit to secure booking. Please see cancellation policy for details re cancelled events. Call Kay on 01522 888688 or 07919 141561 to find out more and to book an aromatherapy party.